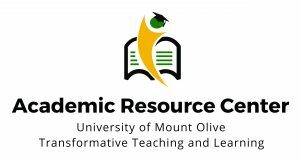 The Academic Resource Center (ARC) is a resource that is committed to providing academic support and learning skills that will maximize the student’s capability of reaching their full potential at the University of Mount Olive. The ARC offers Supplemental Instruction (SI) for challenging and rigorous general education courses. Along with Collaborative Group Sessions (COGS) which are study groups for selective upper division courses. We have a Learning Accountability Program (LAP) for students in need of a structured study experience. The ARC also has a Peer Tutoring Program (PTP) with an abundance of peer tutors available to students for individual course help that is provided online and in person. Clinics for independent learning in subjects such as Math and Accounting are available as well. The Academic Resource Center is located on the first floor of the Henderson Building at the Mount Olive location. The ARC is also accessible no matter where you are with our online resources! The focus of the ARC is to help the student understand course content and develop transferable learning skills. Our programs are designed to meet the needs of the traditional along with the adult and nontraditional college student. To find out more about the Academic Resource Center visit the external page here.